Throughout human history diamonds were the objects of universal admiration and attracted the special attention of notable people. As a status symbol, they decorated royal crowns, or simply sparkled on the ladies’ elegant fingers to the delight of others. Some diamonds are known for rich history, some for their fabulous price, while others have become famous throughout the world for their impressive dimensions. 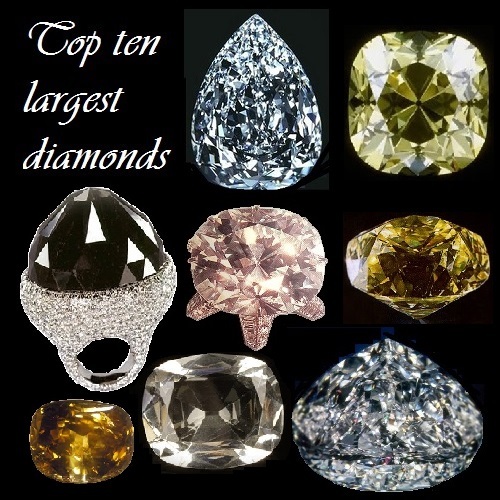 So, the top ten largest diamonds in the world includes Millennium Star, Red Cross, De Beers, Jubilee, Centenary, Spirit of de Grisogono, Cullinan II, Incomparable, Great Star of Africa, and the largest – Golden Jubilee. Millennium Star – colorless diamond weighing 203.04 carats (40.6 grams), pear-shaped with 54 facets. Internally and externally flawless stone is part of the jewelery collection called “Millennium”, owned by “De Beers”. Diamond weighing 777 carats, Star of the Millennium was found in the Mbuji-Mayi (Congo) in 1990. Over three years, employees of the company Steinmetz Diamond Group with the help of laser technology involved in diamond processing. First, it split to Belgium, then polished in South Africa, and the processing was finished in New York, where took place the official presentation of the finished diamond “Star of the Millennium” in 1999. In 2000, during an exhibition in London Millennium Dome was an attempted of theft of a collection, but police arrested the robbers. The real value of the stone is still unknown, but it is insured for 100 million. Pounds. Red Cross – canary yellow cushion-shaped diamond weighing 205.07 carats (41 g), discovered by a South African mining company “De Beers” in 1901. Net weight of mined diamond was 375 carats. After cutting the Red Cross has acquired a mysterious item – through the upper bound can be clearly seen eight-pointed Maltese Cross, from what it got its name. Another distinctive feature of the diamond is represented in its ability to collect light and then glow in the dark. 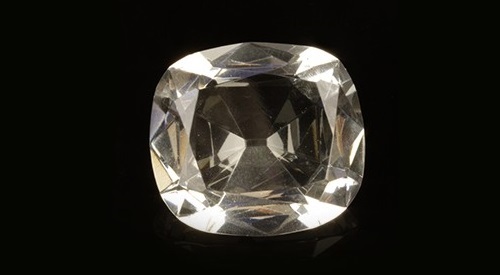 In 1918, the stone was presented as a gift to the British Red Cross, who put the diamond up for auction at Christie’s, where it was sold for 10 thousand. Pounds. All money from the auction was spent on medicines and improvement of hospitals. The Red Cross has twice participated in the auction – in 1973 and 1977. The identity of the current owner of the stone remains unknown. De Beers – pale yellow diamond weighing 234.65 carats (46.9 grams), found at De Beers mine in Kimberley (South Africa) in 1888. In 1921, Maharaja of Patiala Bhupindra Singh bought “De Beers” for his collection. Seven years later, in Paris jewelry house Cartier was made a ceremonial “Patiala necklace”, in the center of which was set diamond “De Beers”. The necklace was decorated with 2930 diamonds weighing 962.25 carats. After the death of an Indian prince of Patiala it disappeared. In 1998, parts of the precious ornaments began to appear in the jewelry market in London, but seven stones in the range of 18 to 73 carat of diamond “De Beers” have not been found. Then jewelry house Cartier bought all the remaining parts of Patiala necklace, and for four years restored it, setting in place of missing originals artificial crystals. 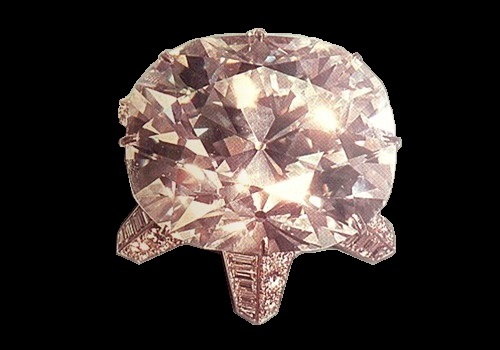 Jubilee or Reitz Diamond – a colorless diamond weighing 245.35 carats (49 g), faceted in the form of “cushion”. Largest diamond weighing 650.80 carats, found in 1895 in Jagersfontein mine in Orange Free State in South Africa, was originally named in honor of Francis William Reitz, the then President of the Free State. 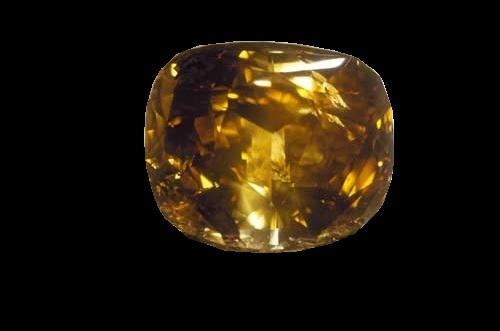 Irregularly shaped gem was cut in 1897, it was named. In 1900 it was introduced at the Paris Exposition, where attracted the attention of the public. The first owner of the diamond “Jubilee” was an Indian businessman Dorabji Tata, who gave it to his wife. When in 1932 an Indian industrialist died, his heirs decided to sell the diamond. Several times “Jubilee” changed owners. 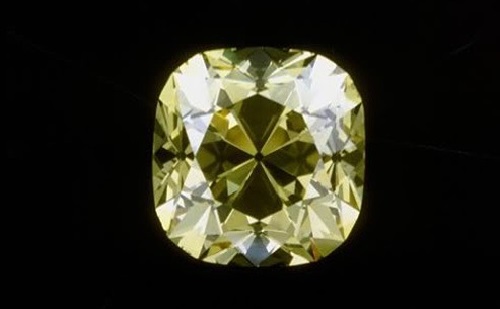 The last owner – Paul-Louis Weiller – bought the gem for the Washington Museum at the Smithsonian Institute, where it can be seen by everyone. 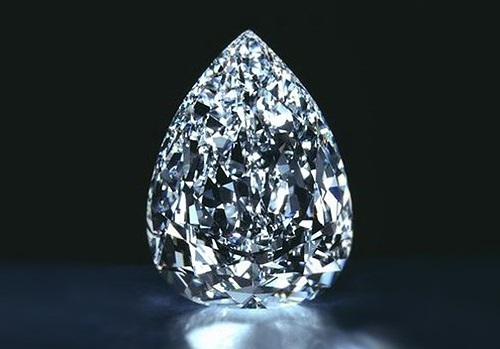 Centenary – a unique diamond weighing 273.85 carats (54.8 grams), owned by the largest diamond mining company “De Beers”. Diamond weighing 599 carats, found in South African diamond mines, was first introduced to the public on the day of the centennial of the firm in 1988. In processed form stone was shown in 1991. Unusual heart shaped stone, according to experts, is the largest diamond of similar characteristics, and is unique. Diamond was loaned to the Tower of London, where it had been shown to the audience for several years. There is evidence that in 2008 the company “De Beers” had sold stone to a wealthy businessman from the United States, whose name remains unknown. Spirit of de Grisogono – the world’s largest black diamond weighing 312.24 carats (62.4 grams). Unique in its beauty and purity the stone was found in Central Africa and originally weighed 587 carats. 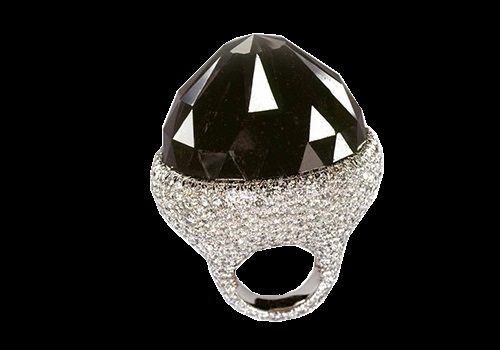 Its first owner was a Swiss jeweller Fawaz Gruosi – master of processing black diamonds. In Switzerland it was faceted in the form of roses – ancient style cut, designed in India. Now diamond “Spirit de Grisogono” is set in white gold ring inlaid with small transparent 702 diamonds weighing 36.69 carats. Rare diamond “Spirit de Grisogono” visited several private collections, but it is still owned by jewelry company “De Grisogono”. Cullinan II – colorless diamond of emerald-cut weighing 317.4 carats (63.5 grams), the second largest diamond of the famous diamond “Cullinan”, the largest in the history of mankind. Giant crystal weighing 3,106 carats was found in the British colony of the Transvaal, South Africa, in 1905. The name was in honor of Thomas Cullinan, the owner of the mine, where it was found. Best lapidary Europe, Joseph Ascher, who had the honor to handle the unique diamond section “Cullinan” by 2 large, 7 medium and 96 small diamonds of exceptional purity. Diamond “Cullinan II” adorns the crown of the British Empire, which are on display in the Tower of London. 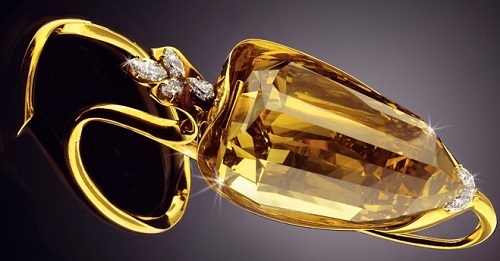 Incomparable – golden yellow diamond weighing 407.48 carats, an unusual triangular shape “Triolet”. It was found by accident in the early 1980s, by a little girl near the abandoned diamond mines in the city of Mbuji Maeve (Congo). Initially, the diamond weighed 890 carats. Diamond “Incomparable” was first put up for sale at auction, “Christie” in 1988, where it was purchased for 12 million USD by Theodore Horovitz from Geneva. In 2002, it appeared on E-bay, where its initial price was 15 million dollars, a record for this type of trading, but no one has responded to this offer. In 2009, the “Incomparable” was exhibited in the Royal Ontario Museum, Canada. In 2013, a unique golden-yellow diamond was set in a necklace of pink gold, inlaid with 91 diamonds, made by the company Mouawad. 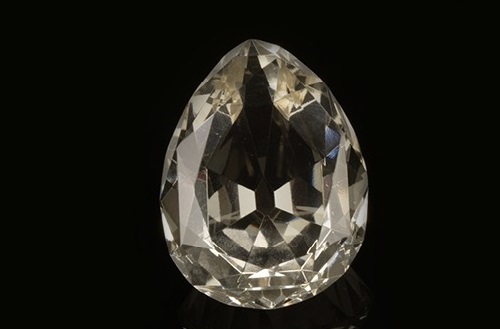 Cullinan I or the Great Star of Africa – a colorless diamond weighing 530.2 carats. 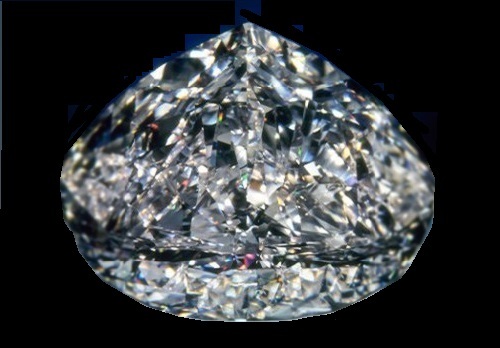 It is the largest part of the diamond “Cullinan”, discovered in 1905 in the British colony of Transvaal (South Africa). In 1907, the Transvaal government presented a diamond as a gift to the British King Edward VII on his 66th birthday. Work on diamond cutting was entrusted to the famous Dutch jewelry house I. J. Asher & Co. Stone of spotless purity was cut in the form of “drop” and got 74 faces. Now the “Great Star of Africa” is in the Tower of London and crowns the scepter of the British monarch Edward VII. 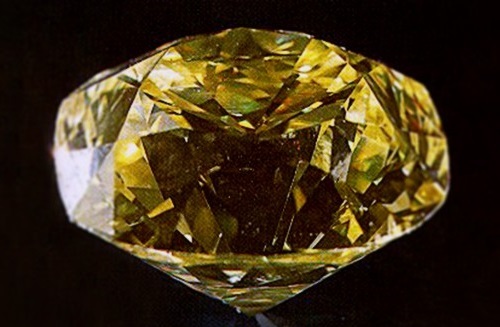 Golden Jubilee – fancy yellow-brown diamond weighing 545.67 carats, which holds the honorary title of the largest diamond in the world. It was found in 1985 in a South African mine “Prime”, owned by “De Beers”. Prior to the cut the diamond weight was 755.5 carats. Outstanding cutter Gabi Tolkowsky spent two years working with it and in 1990 introduced to the world the diamond of striking beauty. The Golden Jubilee was in Thai Diamond Manufacturers Association, which has long demonstrated it as an exhibit. In 1995, some Thai businessmen have acquired a unique diamond and presented it as a gift to the King of Thailand Bhumibol Adulyadej on the 50th anniversary of his reign. This event – the golden anniversary of the monarch – was the basis for the name of a diamond. Currently, the “Golden Jubilee” is at the Royal Palace in Bangkok as part of the treasure of the Thai crown.